North Carolina placed second in the 39th annual National 4-H Forestry Invitational from Sunday, July 29 through Thursday, August 2. Teams from Alabama, North Carolina, and Florida placed first, second and third, respectively. This is the highest a North Carolina team has ever placed in the contest and is the third time that Forsyth County has represented North Carolina in the contest in the last decade. 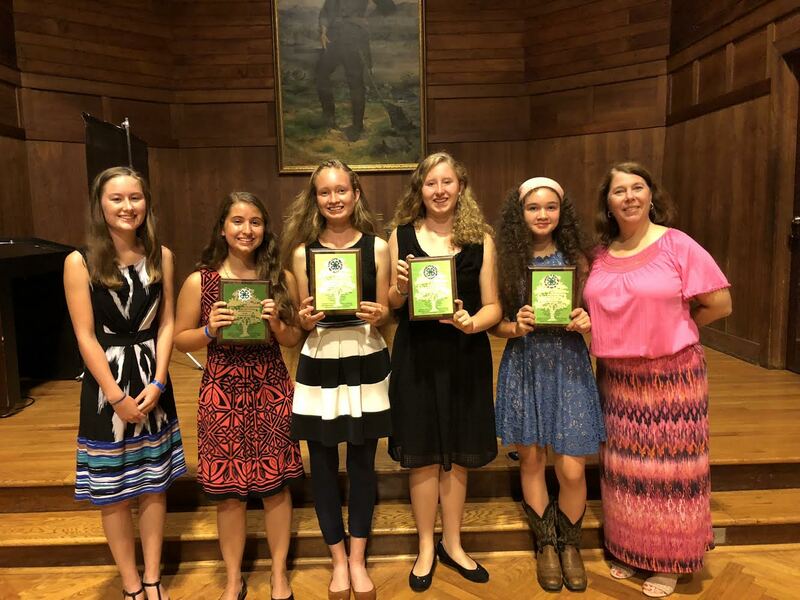 While at the Invitational 4-H members competed for overall team and individual awards in several categories. Events included tree identification, tree measurement, compass and pacing, insect and disease identification, topographic map use, forest evaluation, the forestry bowl and a written forestry exam. The North Carolina team members were Addy Knepp and Shyanne Knepp, Jane Tyler and Suzanne Tyler. The team was coached by Carla Arrowood and Lily and Kim Knepp. The second place high individual was Addy Knepp and Suzanne Tyler was the fourth place high individual. The team also placed second overall in the quiz bowl competition. Jane Tyler received a perfect score on Forest Health. Jane, Suzanne Tyler, and Addy Knepp all received a perfect score for Topographic maps. Addy Kneep received top scores for Compass & Pacing and Tree Measurement. Farm Credit System (FCS) supports rural communities and agriculture with reliable, consistent credit and financial services. FCS has been helping areas grow and thrive for a century by providing farmers with capital and by financing infrastructure and communication services. The Sustainable Forestry Initiative (SFI®), Inc. is a fully independent, charitable organization dedicated to promoting sustainable forest management. The SFI® label is a sign you are buying wood and paper products from a certified source, backed by a rigorous, third-party certification audit. USDA Forest Service State and Private Forestry, Southern Region programs bring forest management assistance and expertise to a diversity of landowners through cost-effective, non-regulatory partnerships. The staffs also play a key role in implementing the National Fire Plan. West Virginia University (WVU) Extension Service educators and volunteers build and sustain partnerships with people and organizations in West Virginia, to improve their lives and communities. WVU’s programs and services strengthen individuals of all ages. The American Forest Foundation® (AFF) works with families, educators, and elected officials to promote stewardship and protect our nation’s forest heritage. AFF works with its partners to provide hands-on support for America’s 10 million family forest owners. Southern Region Extension Forestry serves as a liaison between the USDA Forest Service and the thirteen Extension Forest Resources units in the South. The position has evolved into a regional programming, representation, promotion, and communication role within the forestry and natural resource communities. The Society of American Foresters (SAF) is the national scientific and educational organization representing the forestry profession in the United States. SAF is the largest professional society for foresters in the world. The Association of Natural Resource Extension Professionals (ANREP) is a professional society for natural resource Extension professionals. The mission of ANREP is to bring Extension professionals together to discuss mutual natural resource issues, needs, and opportunities and to advance natural resource Extension through continuing education. F&W is an international forest resource management and consulting firm dedicated to helping landowners gain the most value and enjoyment per acre from their forestland. F&W believes that environmentally viable timberland is economically viable timberland. Columbia Forest Products is North America’s largest manufacturer of hardwood plywood and hardwood veneer products. Columbia’s decorative interior veneers and panels are used in high-end cabinetry, fine furniture, architectural millwork and commercial fixtures. For more information, see the National 4-H Forestry Invitational website. Care to tell us why? North Carolina Cooperative Extension provides residents of our State easy access to the resources and expertise of NC State University and NC A&T State University. Through educational programs, publications, and events, Cooperative Extension field faculty deliver unbiased, research-based information to North Carolina citizens. We can answer your questions on a wide array of topics. Looking for a specific person? Try the Forsyth County Center Staff Directory, or the Full Directory for N.C. Cooperative Extension.